Master the art of Chef Haikal's Warm Canadian Scallop dish, specially created for STREAT 2018. Workshop attendees will learn the correct technique to handling scallops, the fundamentals of sauce making and the art of plating this classic, modern European dish with an Asian twist. Learn the art of Master Chef Emmanuel's Warm Tomato Confit at this workshop that is inspired by Asian vegetable salads with a spicy twist from Szechuan peppercorns. Take away some tips and tricks of handling and cooking vegetables, as well as plating techniques. Chef Emmanuel will also share with you his grandmother’s Flourless Chocolate Cake recipe. Learn the art of Cocktail making with Manhattan’s Assistant Bar Manager Gabriel Carlos.Workshop attendees will learn to mix up delicious cocktails at STREAT's exclusive cocktail masterclass. Workshop attendees will discover the fundamentals of wine appreciation with Jennylene Pañares, Supervisor at Manhattan, recognised as #1 bar in Asia. Attendees will learn the difference between new world and old world wines, the various regions and the grapes varieties. They will also be introduced to the technique of wine tasting using sight, smell and taste to assess quality and different styles of wines. Butterfly Pea Flower Mille Crêpe Masterclass with Chef Winnie Goh, World Gourmet Summit Pastry Chef of the Year 2018. Workshop attendees will learn how to bake a locally inspired cake — Butterfly Pea Flower Mille Crêpe Cake with Young Coconut Jelly and Inaya™ Chocolate Mousse. Attendees will learn to work with the Butterfly Pea Flower which gives each crêpe a vibrant hue of robin egg blue. In between 15 delicate layers of crêpes is a generous spread of light mousse made with Cacao Barry’s Inaya™ Chocolate. Learn the art of fermenting food with Mahota Commune. Workshop attendees will each receive a D-I-Y Kimchi Kit to learn how to make their own kimchi. During the workshop, you will be taught preparation methods and the ways of picking right ingredients for pickling and natural fermentation. Mahota Commune will also educate attendees on the benefits of fermented and pickled food. Learn the the secret behind making of Ang koos, the professional way. The participants get to learn tips and recipe of making a tasty, traditional Ang Koo Kueh. There will be a short, interactive sharing on Ang Koo's history and culture. Lastly, participants get to enjoy the Ang Koos made on the spot! Sakura Hiyashi Somen Masterclass with Chef Angus Chow, World Gourmet Summit Chef of 2018. Workshop attendees will learn how to cook Sakura Hiyashi Somen. The dish gets its name from the inimitable cherry blossoms known around the world for their delicate beauty. Made from the blossoms themselves, the light and slightly sweet noodles are complemented by a perfectly cooked onsen egg. Crunchy sakura ebi provide another dimension to the dish, which is brought to life by the harmonious flavours of wasabi, mitsuba and sesame seeds. 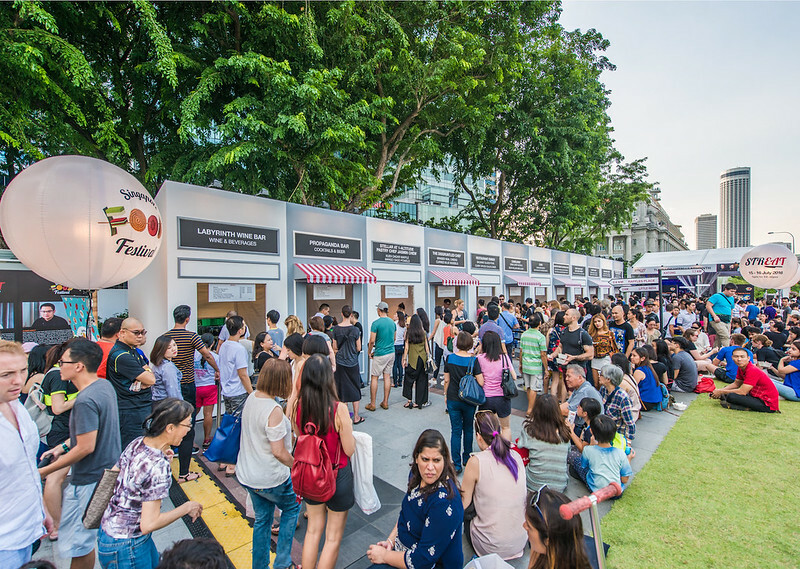 STREAT, the signature event of the Singapore Food Festival, is a two-day long outdoor dining event that features the best of Singapore’s cuisine and culinary talents. Headlining STREAT is a four-hands pop-up restaurant helmed collaboratively by Chef Emmanuel Stroobant (from one Michelin-starred Saint Pierre) and Chef Haikal Johari (from one Michelin-starred Alma). Visitors can also look forward to an exciting line-up of hawkers and chefs who will also be serving up traditional and modern takes on Singaporean classics in addition to culinary workshops, masterclasses, locally-inspired F&B souvenirs and a dedicated stage with local acts.